First thing’s first: How was your Memorial Day Weekend? I hope you had the chance to relax and eat some delicious food. I was able to finally catch The Great Gatsby in theaters and HOLY heaven… Leo! I don’t think he’s been that good looking since his Titanic days. Besides staring into Leo’s eyes via theater projection screen, I was able to accomplish a lot this weekend. I cleaned my room (MAJOR DEAL), booked some flights, spent time with my family, cooked, and instagramed my food like a freak. Yes, I’m totally one of those people. I wish I could say I instagrammed and ate this salmon this weekend, but that’s just not truth. I actually created this dish several months ago and completely forgot about it until recently when I was strolling through my photos. Please forgive me! How could I deny you this magical meal? This salmon. Um, words really won’t do it justice, but I’ll try to describe it in the best way I know how: through super delicious adjectives (obviously) and dramatic descriptors. Brown sugar caramelized. Melts like butter in your mouth. Juicy and sweet (with some heat, if you want it). Gorgeous. Definitely man bait worthy. These words all boil down to one thing and one thing only: You must make this salmon! The fish itself is sweet, with an almost teriyaki flavor. 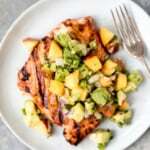 You’ll want to be sure to marinade it for at least an hour or two to let the salmon soak up the lovely flavors from the pineapple juice and soy sauce. A few minutes before I took the salmon out of the oven, I turned on the broiler to get the top of it slightly crispy and caramelized. Mmmmm. 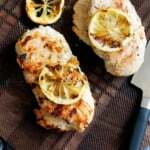 This dinner is perfect for a BBQ or to impress! The healthy fats and protein from the salmon will keep you full and happy. 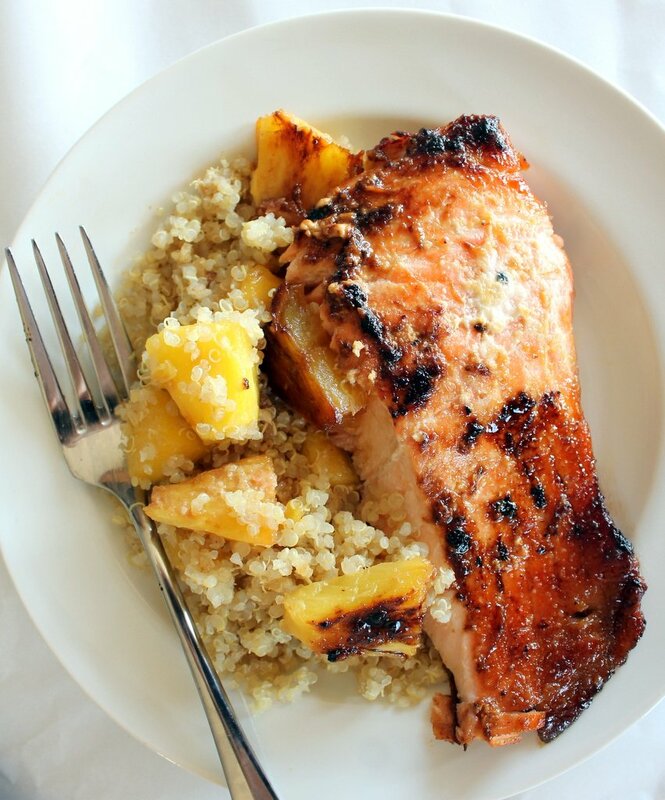 A delicious summer meal: salmon in a sweet brown sugar honey marinade with a gorgeous pineapple quinoa. 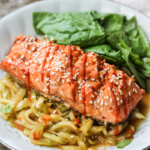 In a large bowl whisk together the marinade ingredients: brown sugar, honey, soy sauce, pineapple juice, mustard, sesame and olive oil, ginger, garlic and red pepper flakes if desired. Place salmon in large ziploc bag and add marinade. Place in refrigerator for up to 8 hours but at least 1 hour. You can also marinade it in a baking pan. Preheat oven to 400 degree F. Spray baking pan with nonstick cooking spray. 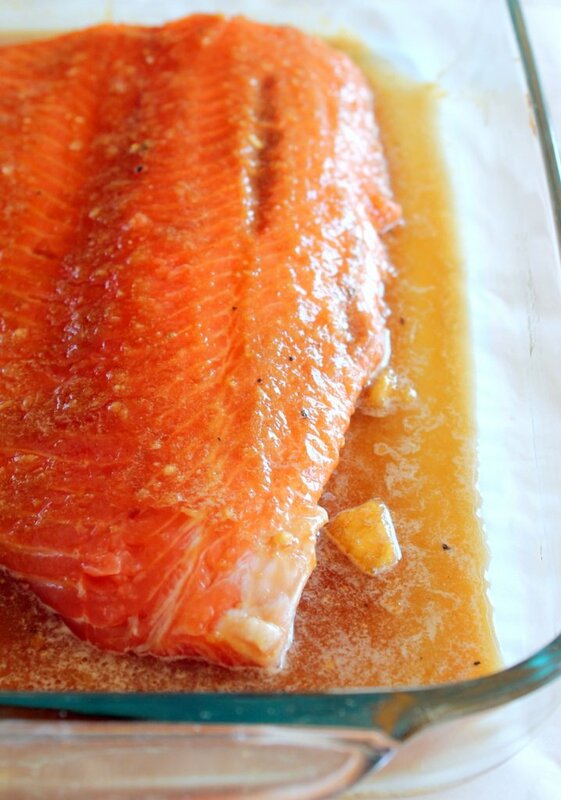 Remove salmon from ziploc bag and place skin side down on large baking pan lined with foil. 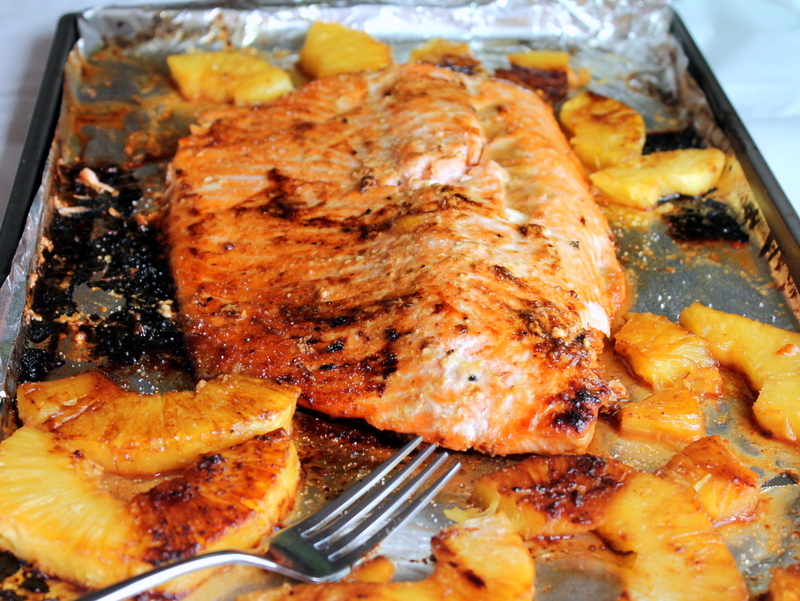 Line pineapple next to salmon and brush leftover marinade on salmon and pineapple. Sprinkle with a little bit of extra brown sugar for extra caramelization. Bake for 15-20 minutes or until salmon easily flakes with fork. I usually broil my salmon for a min or two at the end to get an additional caramelization on top. Just be sure not to dry out your fish! 18 minutes is usually perfect timing for me! **See notes for additional information on cooking times. While salmon is cooking, prepare quinoa. Bring water and coconut milk to a boil in a medium saucepan. Reduce heat to low; add quinoa and cover; simmering until all liquid is absorbed. Remove from heat and let stand another 5-10 minutes. Fluff the quinoa with a fork and set aside. Add in red onion and cilantro to quinoa. 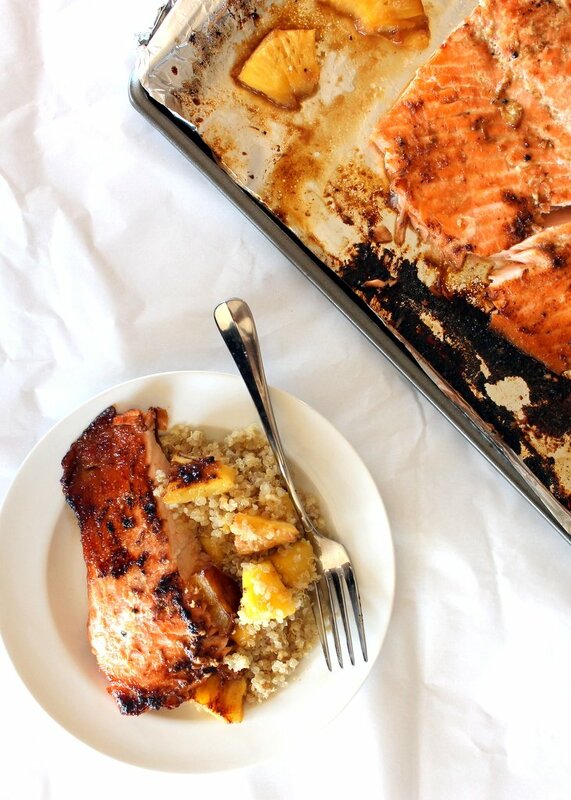 Once salmon is finished cooking, remove pineapple from baking sheet and fold into quinoa. Season with salt and lime juice to taste. Spoon pineapple quinoa evenly into 4 bowls or plates. 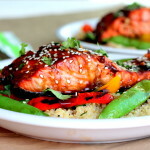 Cut salmon into desired serving sizes and serve with quinoa. Garnish with a tablespoon or two of toasted almonds. Drizzle with extra honey if desired. 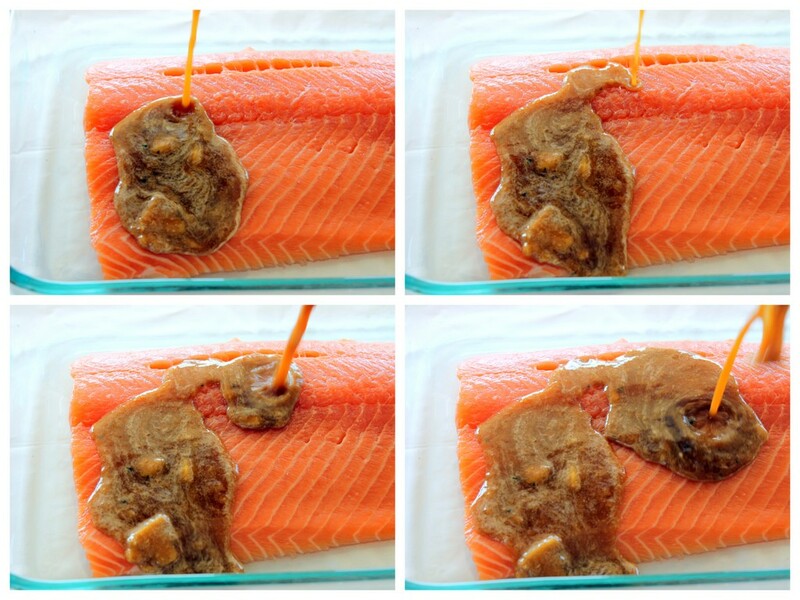 Salmon is very sensitive and can dry out easily if overcooked, so make sure you watch your fish! For every inch of thickness of the salmon, generally it takes about 10 minutes to cook. Usually salmon fillets are about 1 1/2 inches thick. Preparing quinoa ahead of time makes this dish even easier. You can serve the quinoa warm or cold. 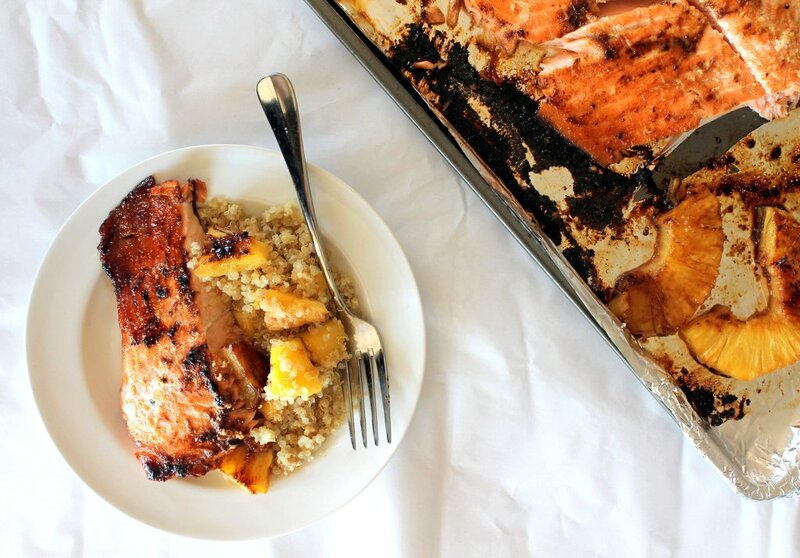 62 Responses to "Brown Sugar Honey Marinated Salmon with Caramelized Pineapple Quinoa"
I saw the Greaty Gatsby too! It was awesome! This is totally my kind of meal! Looks delicious! I made this last weekend, sooooo delicious! That salmon looks so unbelievable!!! I just want to bite it through the screen. 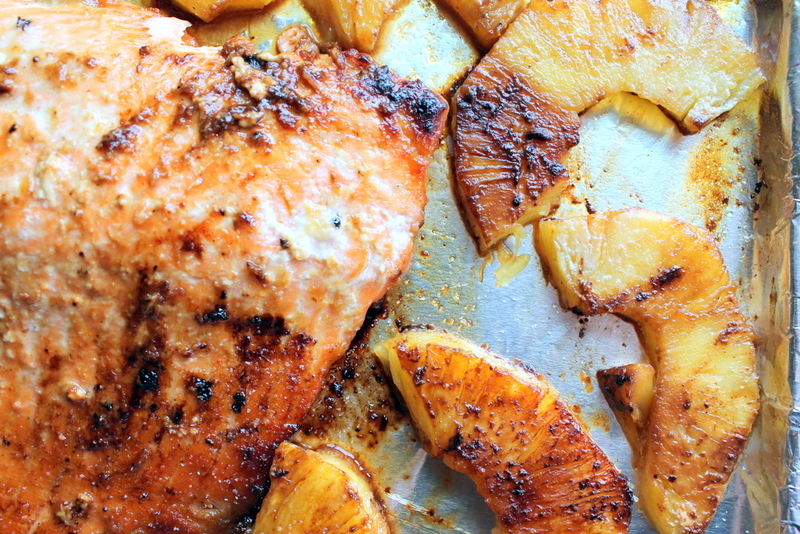 What quantity of salmon do you use for this recipe? Sounds luscious! But how much salmon is in the recipe? That ingredient was omitted from the list with the others. Your Aunt was so very proud of you. As I remember. OMG I have to make that! So sorry Gayle — 1 pound of salmon! I just added it. 🙂 Thanks! ooh salmon is my favorite! this looks wonderful!! This was such a great recipe! My family loved it! Sounds delish! 2 quick questions though: I’m not a huge fan of fresh ginger… Could I omit that? And could I use regular milk or almond milk in place of the coconut milk? Thanks! Can’t wait to try this! I would use water or chicken broth! I can’t decide whether I like the salmon or the quinoa more. This meal is amazing! Leo is definitely aging well! Btw, this salmon is amazing. 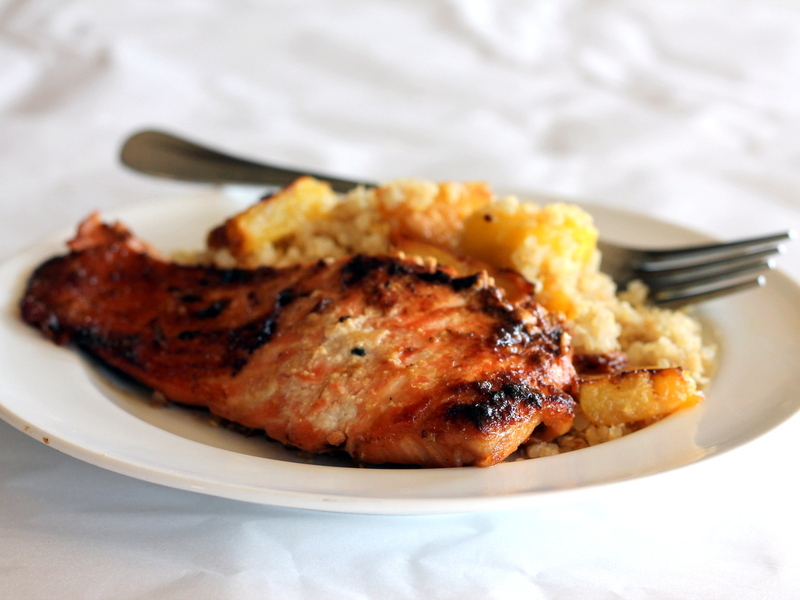 Love that marinade and you know I need that pineapple quinoa – YUM! Tried this for lunch, with celery purée instead of quinoa, the salmon turned out so lovely ! Thanks for the recipe ! Loved great gatsby and Leo! 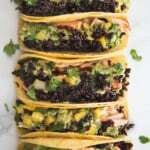 I’m allergic to coconut… What could I substitute for in this recipe?? Thank you! Use chicken broth or water! My hubs and I made this tonight and it was FABULOUS! All 3 kiddos scarfed it down and loved it. Thank you so much for your original, delicious and nutritious recipes. You rock! Monique, do you have the nutrition/calorie stats on this one? It was FABULOUS!!! Making this for my husband for Father's Day! We're both excited! I’ve never cooked Salmon so this is gonna be a first. How long will I broil it at the end? I’m so afraid I’m going to burn it up..lol. Sounds yummy! Just a minute or two! What can I use instead of pineapple juice? Just wondering if i could freeze the salmon in the marinade… And just thaw and bake..i do alot of freezer cooking….What do u think? We just did that tonight. It all worked out great at tasted fantastic! I only marinated this for 2 hours and it was amazing! My very picky 6 year-old couldn’t get enough of it! Do you guys (who have made it) think the cilantro is a must, or could I possibly use basil instead? Making it tonight!! Man bait indeed. I can honestly say that this is the first time I made a dish that blew me away! And it was FISH! I couldn’t stop eating the quinoa (right out of the pot I cooked it in, hah!) 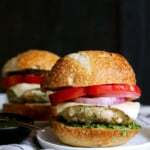 – I skipped the onion and the cilantro and it was still fantastic! 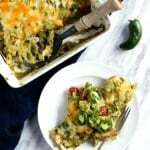 This recipe is the best salmon rscipe hands down. Oh my! !…This looks FANTASTIC….I want it for dinner this very evening…but it is SNOWING to beat the band here in the Jura mountains (France)…Could I just possibly use the purchased, already roasted chicken in the fridge? !…Please say “yes”!! Absolute fan of you…your blog….and the new organization of it….I hadn’t been following for a few months….and this new format is extremely (as it was previously) impressive! Thanks for all of your self-less sharing of your culinary wisdom!!! Can you please clarify that the coconut milk is the stuff in the big tetra pack (like almond milk) and not canned (like used in Thai cooking)? You can use either, but I did use the coconut milk from the carton. I live abroad and everything seems to be called coconut milk… but I used the lower calorie one in a carton marketed as a beverage (coconut water??) and it worked out well. Great recipe! Whole family really enjoyed it. I doubled the fish – there is plenty of marinade either to half the marinade or double to fish…. There is a difference between coconut milk and coconut water, either way I’m happy the recipe turned out for you. Has anyone tried baking these in foil packs instead of just on the pan? ANy luck wit that? Monique – I have made this a couple of times for my family, and everyone loves it! I am hosting my book club and thought it would be an easy dish to offer but am trying to think of a salad to pair with the sweet/soya flavour profile. Any ideas? Is nutritional info for salmon and quinoa or just salmon? Thanks for a tasty, healthy meal!! The entire family ate it with no fussing! I roasted some green beans in the oven while the salmon was cooking! Will make this again!